Simulation in Oil and Gas Industry is at the heart of what we do at Broadtech engineering. We are an engineering consulting firm which delivers world-class and advanced engineering simulation and CFD consulting services via our team of experienced and professional engineering simulation experts who works collaboratively with oil and gas clients and energy companies in Singapore and other locations in the Asia region. Our team of simulation consultants and CAE consulting engineer have a long-standing commitment to serving the energy industry which encompasses professional technical teams involved in the exploration, drilling, production, storage, transportation, refining and end-use petrochemicals. We foster close working relationships with energy industry customers by offering targeted engineering simulation solutions which are aimed at solving a broad set of engineering challenges that each industry sector is faced with. Our engineering simulation team carried out a 3D CFD erosion simulation for a subsea recovery tree used for a gas field development. The outcome and objective of the FEA service were to accurately predict erosion rates at various sections of the subsea recovery tree to verify that the proposed erosion allowances calculated into the piping and fittings were enough. Introducing a sufficient amount of erosion allowance is vitally important, as a scenario of insufficient erosion allowances can result in a leakage of containment. 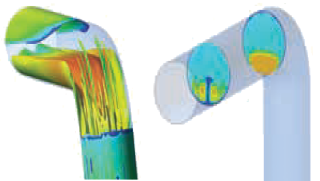 This CFD modeling involved in this simulation case was particularly challenging, as the complexity of the tree geometry meant that fluid flows were highly unstable in many sections of the pipe. However, despite the challenges, we were able to accurately predict the fluid flow behavior and identify pipe sections where an increase in erosion allowances is needed. Performance optimization of mixed-flow inline separators which is used for separating gas from the liquid within pipe segments using cyclonic effect. Inside the pipe, fluid flows are driven into rotating motion by a fixed swirl element which consists of several successive curved blades. The resultant rotational centrifugal force generated channels the gas phase toward the center region, where it is carefully extracted via a central outlet. Using Fluid dynamic simulation to carry out CFD flow analysis, we were able to help our client to have a deeper insight into multiphase flow and phase separation processes, which can influence future development in the design of both related product and process. 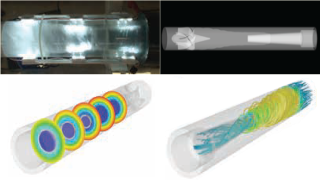 The CFD results were validated through actual physical experiments which confirm trends identified during simulations carried out with identical process conditions. Structural optimization of gimbal system which is used for dampening shock impact forces in order to protect critical piping sections along with the module that boosts fluid flow. 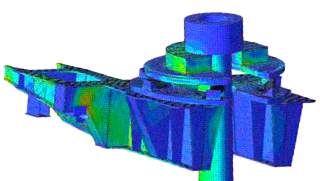 Using professional FEA software to perform FEA mechanical analysis, our engineering design consultants were able to identify the critical stress areas that can be optimized. By taking into account the related motions of the rig in a marine environment (six degrees of freedom (6 DOF): Yaw, Roll, Pitch), a design solution was proposed to ensure that the force loadings are not transferred to piping structure. It consists of 20 meters of piping which connects the recovery system to the distribution system. Such a pipe system is usually designed to have a useful lifespan of 20 years, during which it is exposed to the physical effects of internal and external fluid flows which can induce severe vibration. By subjecting the pipe system to a range of internal volumetric flow rates, we were able to identify specific critical stress areas and confidently predicted that the pipe system design can bear these stresses values and satisfy the required fatigue life. 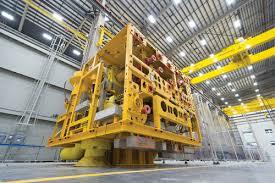 Investigation Analysis and solving of vibration-related issues due to internal flows occurring inside subsea piping. CFD engineering simulation was carried out using the Reynolds stress model to accurately predict the 1. Fluid loading forces exerted on the pipe structure and to determined the 2. Wall pressure fluctuations of high Reynolds number multiphase flows. 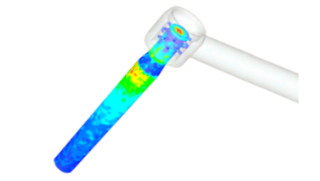 Through the use of advanced CFD simulation software, we were able to correctly predict the fluctuation frequency of the wall-pressure downstream at a single pipe bend. 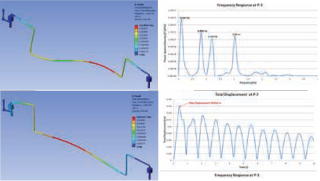 Using this fluctuation frequency together with the natural frequencies of the piping system, we were able to identify and solve potential flow-induced vibration problem for a new subsea production system. For single-phase and multiphase flows, our simulation engineers were recently able to perform CFD simulations with Reynolds numbers up to 1 million, using the SST turbulence model. CFD simulation solutions are used extensively in oil and gas application throughout the global energy supply chain. This includes oil and gas application areas such as transport, subsurface pipeline, post-processing, and refining, whereby it largely involves multiphase fluid flows. 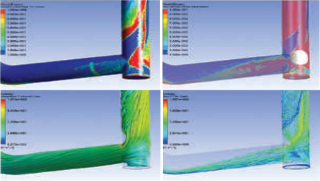 Using CFD engineering analysis, flashing simulation were performed to give accurate visual insights into the contour patterns of the vapor phase mass fractions at the various cross sections of the downstream pipe flow. * The Red region indicates maximum, blue region indicates minimum. The analysis results reveal the mass fractions of vaporized hydrocarbons steadily increase with increasing distance downstream away from the original mixing point. In this FEA consulting project, a FEM Thermal analysis was performed in combination with CFD simulation to get useful insights into the thermal effects of sea currents on subsea trees. Through accurate mapping of external convective heat coefficients for a specific site and subsea tree design, we ensured that the system thermal properties are optimized for both steady and transient states. Without the engineering simulation capabilities of CFD companies such as BroadTech engineering, such an engineering analysis would have to require on empirical calculations which can introduce a high level of human error. The detailed engineering simulation and CFD Thermal analysis on the integrity of the entire system as well as individual components which is subject to various environmental structural and thermal conditions offer our clients a high level of assurance and confidence in the system performance. The successful design of an offshore vessel requires that sea wave loading forces and the slamming motion created by irregular wave are accurately taken into account in the CFD engineering simulation. Using Engineering simulation and numerical modeling, our simulation engineers at BroadTech Engineering are able to analyze free-surface flows and investigate its related motions at sea (six degrees of freedom (6 DOF): Yaw, Roll, Pitch) for offshore Floating Production, Storage and Offloading units (FPSOs), platforms, and other sea vessels used for oil and gas drilling, production and transport. Sample simulation data obtained from a CFD analysis study reveals two consecutive sequences of peak impact pressure incidence (5,000 metric tons) on a twin-hulled offshore ship vessel. Drill cuttings produced sand, and transportation of proppants can significantly reduce the useful life of critical oil field equipment hardware, pipelines, and downhole tools through erosion over a prolonged period of usage. In our CFD services, we are able to carry out CFD fluid flow modeling of either Single or multiple fluids which/that also takes into account particle size and loading forces. 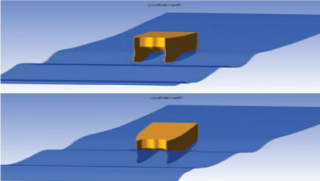 A wide array of industry-accepted models is provided to determine erosion rate. Engineering simulation calculations account for material wear, such that the engineering geometry design is dynamically modified as the material is gradually eroded. 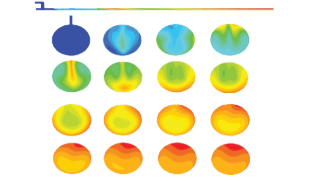 The image of the CFD simulation shows contour distribution of various erosion rates on a choke valve. Discover what our FEA consulting services can do for your company today by calling us today at +6581822236 for a no obligation discussion of your needs.